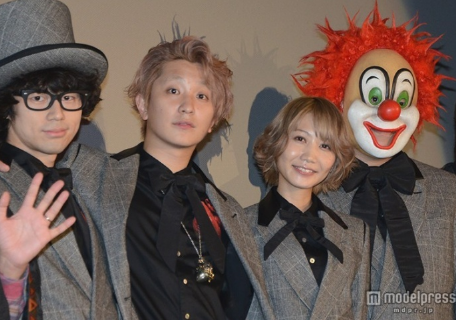 SEKAI NO OWARI’s Saori gets married, Nakajin is engaged! It was announced today on their website that SEKAI NO OWARI’s pianist, Saori gets married! In addition, the leader, Nakajin, has announced his engagement. Saori marries 30 years-old actor Dai Ikeda who has appeared in dramas like Ando Lloyd – A.I. Knows Love? and Yamegoku: Helpline Cop. Nakajin, on the other hand, has been engaged to a non-celebrity woman. The two announcements were exclusively for the fan club members. SEKAI NO OWARI is scheduled to have their stadium tour this year beginning on January 22-23 at Saitama Super Arena. They will also perform five shows nationwide including Kyocera Dome Osaka on February 11-12. Regarding my private affairs, I have decided to get married with the actor, Dai Ikeda. We have been in a relationship for 5 years, and there has been difficulties in my work as well as my health. I was able to come this far thanks to his support. Although the two of us are still inexperienced, we have decided to walk together. I would like to build a warm family as an individual and as a member of SEKAI NO OWARI. Please support us from now on. Thank you for your never ending support! Although this is about my private affairs, I have decided to be engaged with a non-celebrity woman who has been with me for quite a time. It has been around 4 years since we started dating, yet she supported me in my rough times. As a bachelor, I am still inexperienced. But I would like to overcome difficulties in the future with her. I decided to get married in order to become more energetic during band activities. Please support us from now on.